GENEVA/KINSHASA (Reuters) - Two dying Ebola patients were spirited out of a Congo hospital by their relatives on motor-bikes, then taken to a prayer meeting with 50 other people, potentially exposing them all to the deadly virus, a senior aid worker said on Thursday. Congo’s ninth recorded outbreak of the disease is thought to have killed at least 22 people so far, according to government figures released on Wednesday - lower than the last estimate of 27, after some of those deaths turned out not to be Ebola. “All it takes is one sick person to travel down the Congo River and we can have outbreaks seeded in many different locations ... that can happen at any moment. It’s very hard to predict,” he said, referring to the river linking the trading hub of Mbandaka to the capital Kinshasa, whose population is 10 million. In past outbreaks, mourning relatives have caught the hemorrhagic disease by touching the highly contagious bodies of dead loved ones, sometimes by laying hands on them to say goodbye. KINSHASA/DAKAR/GENEVA/NEW YORK, 25 May 2018 – Children continue to be at risk and are affected by the ongoing Ebola outbreak in the Democratic Republic of the Congo (DRC), making it essential that their health and wellbeing are prioritized in the response. UNICEF is scaling up prevention efforts in schools across all three affected health zones. This includes on-going efforts to install hand washing units in 277 schools and supporting awareness raising activities reaching more than 13,000 children in Mbandaka, Bikoro and Iboko. UNICEF is also concerned about the wellbeing of children with family members who have contracted the disease. “Children whose parents or caregivers die of Ebola or who live in isolation because they had contact with an infected person, need psychosocial support to help them cope,” said Dr. Rotigliano. Previous Ebola outbreaks have demonstrated the need for social workers to identify and assist vulnerable children. Twenty-two psychosocial agents trained by UNICEF and its partners are providing assistance to families that are affected by the Ebola outbreak, while UNICEF is also supporting 23 families and their children who have relatives infected with Ebola by supplying household kits and food rations. UNICEF continues to work closely with communities to promote behaviors that help stop transmission, such as safe burials and hand-washing. The children’s agency is engaging in dialogue with community leaders, conducting outreach campaigns and supporting door-to-door awareness raising campaigns. In Mdandaka, 706 community actors were identified and are being deployed for Ebola prevention communication and community social engagement. It is now three weeks since the ebola outbreak was announced publically (http://www.avianflutalk.com/ebola-again_topic37320_page1.html) and four weeks since it started. Vaccinatins are only scheduled to strt tomorrow ( https://www.independent.co.uk/news/world/africa/ebola-outbreak-congo-latest-vaccination-mbandaka-bikoro-iboko-who-a8370921.html). There are two possible ways to look at this: Should one be amazed that it all happened so quickly? Or should one mourn those for whom it came too late and slate the WHO for procrastination? Ebola among semi-tribal people spreads like a fire and I know the vaccine arrived in the DRC a week ago, so I favour the former. The Phase 1 clinical trial, named as VRC 608, is examining the safety and tolerability of a single monoclonal antibody called MAb114, developed from an Ebola survivor. Investigators aim to enroll between 18 and 30 healthy volunteers aged 18 to 60. The trial will not expose participants to Ebola virus. "Ebola is highly lethal, and reports of another outbreak in the DRC (Democratic Republic of Congo) remind us that we urgently need Ebola treatments. "This study adds to NIAID efforts in conducting scientifically and ethically sound biomedical research to develop countermeasures against Ebola virus disease," Fauci added. MAb114 is a monoclonal antibody—a protein that binds to a single target on a pathogen, isolated from a human survivor of the 1995 Ebola outbreak in a city in the DRC. Researchers from the NIAID discovered that survivor retained antibodies against Ebola 11 years after infection. They isolated the antibodies and tested the most favourable ones in the laboratory and non-human primate studies, and selected MAb114 as the most promising. The researchers illustrated that MAb114 binds to the hard-to-reach core of the Ebola virus surface protein and blocks the protein's interaction with its receptor on human cells. A single dose of MAb114 protected non-human primates days after lethal Ebola virus infection. In the trial, which would be fully enrolled by July 2018, the first three participants will receive a 5 milligram per kilogram intravenous infusion of MAb114 for 30 minutes. The team will evaluate safety data to determine if the remaining participants can receive higher doses (25 mg/kg and 50 mg/kg). Participants will have blood taken before and after the infusion and will bring a diary card home to record their temperature and any symptoms for three days. Participants will visit the clinic approximately 14 times over six months to have their blood drawn to see if MAb114 is detectable and to be checked for any health changes, the report said. Ebola virus disease is a serious and often fatal illness that can cause fever, headache, muscle pain, weakness, fatigue, diarrhea, vomiting, stomach pain and haemorrhage (severe bleeding). First discovered in humans in 1976 in the DRC, the largest outbreak, occurred in West Africa from 2014 to 2016. It caused more than 28,600 infections and more than 11,300 deaths, according to the World Health Organization(WHO). In May 2018, the DRC reported new Ebola outbreak. While there are no licensed treatments available for Ebola virus disease yet, multiple experimental therapies are being developed. The Daily Express (we call it the distress) is claiming the outbreak is out of control. Ebola outbreak 2018: What's different this time? (CNN) More than 400 people have been vaccinated and more than 800 contacts traced in the city of Mbandaka in the Democratic Republic of Congo. Use of the experimental vaccine, known as rVSV-ZEBOV, will now spread to the more rural regions of Iboko and Bikoro where the majority of cases have occurred. Vaccination began in the urban setting of Mbandaka to "prevent an urban outbreak" as well as further spread along the nearby Congo river, to reduce "risk through the interior of DRC and surrounding countries," Dr. Peter Salama, the deputy director-general of the World Health Organization's Health Emergencies Program said Tuesday. He confirmed the outbreak spread to Mbandaka after two brothers visited Bikoro to attend a funeral and traveled back to the city. "Mbandaka is relatively safeguarded at the moment," he said, adding that officials "haven't seen an explosive increase in cases" and the teams have reason to "cautiously optimistic." There have been 54 cases of Ebola reported in Congo, including 25 deaths. Thirty-five of those case have been confirmed with laboratory tests. Salama said 47 of the cases were in the more rural regions of Bikoro and Iboko where control efforts will now be focused. "That's where the next phase of vaccination must go." The vaccine is proving to be a very acceptable intervention to the community in Mbandaka, Salama said. "There are no reports of refusal of the vaccination." "Over 90% of eligible people are getting vaccinated," said Dr. Michael Ryan, WHO assistant director-general for Emergency Preparedness and Response, highlighting that this is a strong coverage rate for any vaccine. health worker prepares an Ebola vaccine to administer to health workers during a vaccination campaign in Mbandaka, Congo. More than 900 contacts are being followed in Congo, and the number is likely to increase. The Ebola vaccine being provided has been shown to be safe in humans and highly effective against the Ebola virus, according to the WHO. A 2016 study found it to be 100% effective in trials in Guinea in coordination with the country's Ministry of Health after the 2014-15 outbreak. Five experimental drugs to treat Ebola virus disease, including ZMapp and Remdesivir, have now arrived in the country and will be trialed under strict experimental research protocols, Salama said. This means they will have to be used as part of a clinical trial, with ethical review and informed patient consent. Officials expect to get formal approval for delivery in the coming days. HO officials hope to introduce the life-saving therapies to patients, but their use will require sophisticated monitoring. Some of the treatments require IV infusion, while others require daily assessment of liver and kidney function, according to Ryan. In 2014, ZMapp became known when it was used to treat two American missionary workers, Dr. Kent Brantly and Nancy Writebol, who contracted Ebola in Liberia. Prior to that, the experimental drug had been tested only in monkeys. This is "not a simple effort to do this kind of trial in this kind of environment," said Salama. But "if we don't learn now we'll never know which drugs to use in this situation." Vaccination, therapeutic and control efforts have and will be carried out through partnerships between WHO, the International Federation of the Red Cross and Red Crescent Societies, Medecins sans Frontieres (Doctors Without Borders) and many other NGOs on the ground in Congo. Control efforts will expand to four more provinces considered to be at risk, the IFRC confirmed. The first human outbreaks of Ebola occurred in 1976, one in the north of what is now Congo and in the region that is now South Sudan. 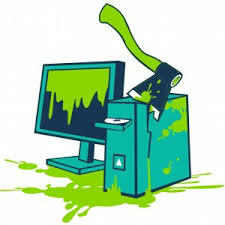 Humans can be infected by other humans if they come in contact with bodily fluids from an infected person or contaminated objects from infected persons. Humans can also be exposed to the virus, for example, by butchering infected animals. May 30, 2018 -- The United Nations' World Health Organization on Tuesday said it was "cautiously optimistic" that efforts to slow the spread of Ebola in a Congolese city were working. There are still cases occurring in more remote areas, however, the WHO said, with a total of 35 confirmed cases, 12 of which have been fatal. So far, more than 400 people have received an experimental Ebola vaccine that's never before been used in an emerging outbreak, the Associated Press reported. Officials from World Health Organization (WHO) today said they're cautiously optimistic about curbing the spread of Ebola in the city Mbandaka, Democratic Republic of the Congo (DRC), adding that the next phase of the outbreak response will focus on two remote hot spots in Bikoro and Iboko, where most of the cases have been reported. At a briefing in Geneva today live-streamed on the WHO's Twitter feed, health officials also said DRC's health ministry is finalizing protocols for testing five therapeutic treatments and that a trial of a second experimental Ebola vaccine—a prime-boost regimen developed by Johnson & Johnson—may take place in the outbreak setting. Peter Salama, MD, the WHO's deputy director-general of emergency response, said that, as of May 27, 54 Ebola cases have been reported. The number includes 35 confirmed, 13 probable, and 6 suspected cases. So far 25 deaths have been reported. Salama said the updated numbers add one suspected case in Wangata health zone, which is in Mbandaka. Tests have ruled out Ebola in three suspected cases, one from Ntondo health zone. Response teams are monitoring more than 900 contacts in the DRC's three hot spots. Of the outbreak's 54 cases, 47 are from Bikoro and Iboko, Salama said. "That's where our priorities must be going forward." He said on Twitter yesterday that the WHO surged more staff over the weekend to respond to reports of increasing cases in Iboko. More than 400 people have been immunized in a ring vaccination campaign in Mbandaka involving Merck's experimental VSV-EBOV vaccine that began on May 21, targeting contacts of Ebola cases, plus contacts of contacts. He said besides the city's large size, the initial response centered on the area because of the risk of spread to other parts of the DRC as well as two neighboring countries, the Republic of Congo and the Central African Republic. Vaccination in the city went very smoothly, and so far there haven't been any reports of vaccine refusal, Salama said, adding that vaccinators have reached about 90% of the contacts targeted for immunization. Though there is a 10-day window after vaccination before immunity kicks in, he said there hasn't been an explosion of cases in the city, a positive development that's part of what's fueling cautious optimism. Salama said there are three transmission chains in Mbandaka: one involving brothers who attended a funeral in Bikoro, one linked to a patient who visited a health center in Bikoro, and one who attended a community church gathering. Now, it's time to battle the outbreak at its source, in Bikoro and Iboko, he said. Michael Ryan, MD, the WHO's assistant director-general for emergency response, who just returned from the outbreak region, spoke of the huge logistical challenging in laying the groundwork for the response in the remote settings where most of the illnesses are occurring, but he said he is encouraged by the response he saw to the vaccination campaign in Mbandaka. "It's the first time in my experience where walking into villages with the vaccine teams you see hope and not terror," he said. Doctors Without Borders (MSF) said today that it started vaccinating healthcare workers yesterday in Bikoro and that immunization will be offered to contacts of patients as part of the ring vaccination approach. The group said the vaccine is one element of a larger strategy to control the spread of Ebola. Micaela Serafini, MD, MPH, MSF's medical director in Geneva, said the group will be closely monitoring people who are voluntarily vaccinated and that, based on results in Guinea's outbreak, officials are confident about its use in the current outbreak. "The results of the trial suggest that the vaccine will present a real benefit to people at high risk of contracting Ebola, protecting them against the infection," she said. Salama said vaccination is slated to begin this week in Iboko. The DRC government is eager to begin using experimental treatments in Ebola treatment units, and Salama said the programs and their companion clinical trials will likely begin in the coming days. They include ZMapp (a monoclonal antibody cocktail), Remdesivir (an antiviral), Regeneron (a monoclonal antibody treatment), favipiravir (a small-molecule antiviral), and a monoclonal antibody known as 114. He said that doing clinical trials, especially in the remote settings, will be a challenge, given that some of the drugs involved intravenous administration over 6 to 12 hours and daily assessment of kidney and liver function. Salama said the trials, done under the auspices of the health ministry, will, it is hoped, test the efficacy of all five drugs and assess how they compare to each other. "If we don't use the opportunity to learn in this situation, we'll never be able to know which is better," he said. Research on a second vaccine? Salama said one of the critical questions researchers hope to answer with current trials under way as part of ring vaccination with VSV-EBOV is duration of protection. He said data from the trial in Guinea suggest the vaccine's protection lasts well over a year, and health officials suspect it might last much longer than that. He said officials are exploring, along with the DRC government, if there's an opportunity to test whether another vaccine that works in a different way has the potential to protect for an even longer period. The second vaccine approach, part of a prime-boost strategy, involves a dose of the adenovirus vectored Ad26.ZEBOV developed by Johnson & Johnson and a dose of MVA-BN-Filo from Bavarian Nordic. Medical investigators will need to overcome the rural region’s extreme logistical hurdles to reconstruct transmission chains, vaccinate contacts and halt the spread. Aiming to squelch an Ebola outbreak that has infected 54 people, killing almost half of them, aid workers in the Democratic Republic of the Congo have begun giving an experimental vaccine to people in the rural region at the epicenter of the outbreak. Epidemiologists working in the remote forests have not yet identified the first case, nor many of the villagers who may have been exposed. Investigators will need to overcome extreme logistical hurdles to reconstruct how the virus was transmitted, vaccinate contacts and halt the spread. “For an epidemic to be under control, you need a clear epidemiological picture,” said Dr. Henry Gray, the emergency coordinator for Doctors Without Borders. Almost 500 people received the experimental vaccine, VSV-EBOV, last week around Mbandaka, a riverfront city of more than 1.5 million people where four Ebola cases have been confirmed. Mbandaka is a priority because it is a traffic hub. The Republic of the Congo lies just across the Congo River, and Kinshasa, Congo’s capital of 10 million, is less than 500 miles downstream. Aid workers are using the ring method: The vaccine is given to groups of people in contact with each Ebola case, such as family caregivers, as well as the contacts of those contacts. About 7,500 doses are available to vaccinate 50 rings of 150 people each, according to Dr. Peter Salama, the deputy director-general for emergency response at the World Health Organization. An additional 8,000 doses will follow. The W.H.O. is monitoring more than 900 contacts throughout Équateur province. As the vaccination program expands to the Bikoro and Iboko communities, where most cases have been reported, teams are relying on contact tracing to identify the most urgent recipients. “This is where everything gets more complicated,” said Chiran Livera, the operation leader in Congo for the International Federation of Red Cross and Red Crescent Societies. The villages surrounding Bikoro and Iboko are among the most isolated and densely wooded pockets of Congo. Aid workers must use motorbikes to navigate cratered dirt roads that flood during the rainy season. Maps of some regions are incomplete, and vast gaps in cellular service thwart efforts to report data to central operations. If the outbreak worsens, a second vaccination may be offered to health workers. That vaccine, developed by Johnson and Johnson, requires two doses and would take longer than VSV-EBOV’s seven to 10 days to become effective — but may protect health workers for several years. The Congolese Ministry of Health is planning to deploy up to five experimental treatments, though the two most highly recommended by the W.H.O. may prove impractical in a remote setting. ZMapp, a cocktail of three antibodies used in West Africa, must be given in multiple doses and must be refrigerated. Remdesivir, a drug developed by Gilead Sciences, requires intensive monitoring of liver and kidney function — nearly impossible for treatment centers without electricity, running water or standard equipment. Another option, called MAb114, began safety trials earlier this month. Made from the antibodies of an Ebola survivor, it can be crystallized and reconstituted with saline-like fluids in the field. “These are all investigative products,” Dr. Salama said. Vaccine makers have struggled to show efficacy without live Ebola cases in which to test their drugs. “Many consider this outbreak their chance to prove themselves,” he said. Drug companies are not alone in that mission. The W.H.O.’s emergency committee gathered 10 days after the Congolese government notified the organization of an Ebola case, a stark contrast to the West African epidemic in 2014, when the group did not convene until almost 1,000 people had died. Since May 8, the W.H.O. has sent 156 technical experts to the region. A mobile laboratory has been set up to expedite case confirmations in Bikoro; another is planned for Mbandaka. A cellular tower has been erected in Mbandaka to help workers trace people who may have been infected throughout the region. The W.H.O. has more than doubled its budget request to $56 million from $26 million to account for the possibility of the virus may reach an urban setting. Another advantage is context: Unlike West Africa, Congo has experienced eight previous Ebola outbreaks since the virus was identified in 1976. Aid workers who arrived in Kinshasa this month found pre-established surveillance protocols, according to Mr. Livera. The W.H.O.’s strategy assumes the virus will ultimately infect 100 to 300 people. Each rural case may infect 10 contacts, and each urban case may infect 30. Response activities may continue into July, according to a revised plan released May 27. Until investigators identify the index case, it is impossible to discern whether the first patient detected in April was truly the first human case or the hundredth, according to Dr. Gianfranco Rotigliano, the regional director of Unicef. Until then, it is impossible to quantify the crisis. More than 680 people have received Ebola vaccinations in the three areas of the Democratic Republic of Congo (DRC) where dozens of cases of the deadly virus have been confirmed, the country's health ministry has said. Health experts are pushing to find contacts of those infected, having already located more than 1,000. As of Friday evening (GMT), there have been 37 confirmed Ebola cases in the DRC, including 12 deaths. There are another 13 probable cases, according to the country's health ministry. Officials from the ministry could be seen on Friday in Mbandaka. The city of 1.2 million people is the provincial capital of northwest Equateur province. The officials were registering a young girl, whose parents died from the virus. She is now under UNICEF's care. Further away, a young boy is sitting in a chair with a high fever. He is suspected of having been infected with the virus and has been placed in quarantine as a precaution. While nearly 500 people have been vaccinated in Mbandaka since 21 May, ignorance about the virus' existence is still a threat. "Most people here in Mbandaka and maybe in Bikoro and elsewhere are still ignorant. They have not yet understood that Ebola really exists," Dr. Hiller Manzimbo, a hospital director, told The Associated Press. Manzimbo was referring, among others, to Irene Mbwo, the widow of an Ebola victim, who does not recognise that her husband died from the virus and has refused the vaccine herself. "They just told me that he died of Ebola, but they did not publish his blood results," she told The Associated Press. "But how can they claim that he died of Ebola, when they say that those who came in contact with him will see symptoms of infection within three days, and I told them at the hospital today that I have been clean for 21 days?" she insisted. In an Ebola plan released this week by the World Health Organisation (WHO), the UN's health agency predicted there could be up to 300 cases in the coming months, noting there could be three times as many contacts to chase if the virus spreads in urban, as opposed to rural, areas. Although WHO officials said "more than half" of newly confirmed Ebola cases had been previously identified, a substantial portion of cases are showing up that were not being monitored, meaning the disease is in some cases spreading unnoticed. The WHO also said officials would likely need more triage, isolation and treatment centres, possibly including one in the capital, Kinshasa. It said additional aircraft, helicopters and boats were needed to manage the challenging logistics of the outbreak and that it might ultimately cost 56 million US dollars to contain Ebola. The UN health agency said that based on an initial assessment of Bikoro, "there is an approximate movement of over 1,000 people per day by river, road and air at major points of entry. "It recommended that neighbouring countries strengthen their capacity to identify imported cases of Ebola, including by implementing exit screening. The WHO said the risk of spread to elsewhere in Africa was high but that the risk of global transmission was low. It added that even though experts had concluded the outbreak conditions do not currently merit being declared a global emergency, the situation would be re-evaluated if the epidemic spikes significantly or if there is international spread. 37 confirmed cases, 13 probable and seven suspected for a total of 57 cases, including 25 deaths since early April 2018. The outbreak remains localized to the three health zones initially affected: Iboko, Bikoro and Wangata. Since the launch of the vaccination exercise on 21 May 2018, a total of 682 people have been vaccinated. The targets for vaccination are front-line health professionals, people who have been exposed to confirmed EVD cases and contacts of these contacts. After recruiting and training 18 Congolese volunteers, Africa CDC has just deployed them to Equateur province to support the response to Ebola Virus Disease in DR Congo. 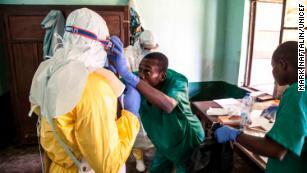 The responders, who are former volunteers of the African Union Support to the Ebola Outbreak in West Africa (ASEOWA) in the 2014-16 outbreak, they also participated in the post-Ebola enhanced surveillance in the Democratic Republic of Congo in July 2017 in the province of Bas-Uélé. 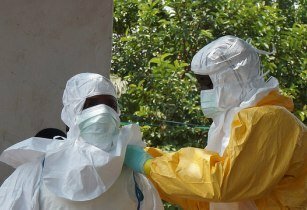 In response to the ongoing outbreak of Ebola in the Democratic Republic of the Congo, WHO in collaboration with the Government of the Democratic Republic of the Congo, the International Organization for Migration (IOM), Africa Centres for Disease Control and Prevention (Africa CDC) and other partners, has developed a comprehensive strategic response plan for points of entry. The aim of the plan is to avoid the spread of the disease to other provinces or at the international level. The plan includes mapping strategic points of entry and the locations of areas where travellers congregate and interact with the local population, and therefore are at risk of Ebola virus disease transmission based on population movement. The plan also includes implementing health measures at the identified points of entry/traveller congregation points, such as risk communication and community engagement, temperature checks, provision of hand hygiene and sanitation materials, and the development of alert, investigation and referral procedures. As of 18 May 2018, a total of 115 points of entry/traveller congregation points have been listed and mapped along cordon sanitaires in Mbandaka, Bikoro, Iboko, larger Equateur Province, and Kinshasa. Of these, some 30 points of entry have been prioritized for in-depth assessments and for implementing relevant prevention, detection and control measures. These include major ports and congregation points along the Congo river, as well as the two airports and the international port in Kinshasa. Areas of large gatherings such as markets are also being assessed. Along the Congo river there are many private smaller ports and points of congregation with a low volume of traffic. Proper screening cannot be conducted at all 115 points, and the efforts currently focus on the 30 prioritized points of entries/ traveller congregation points, as well as on risk communications activities and community engagement. Entry and exit screening measures have been implemented at the Mbandaka airport, as well as in some terminals of the Kinshasa international airport. These include travel health declaration, visual observation for symptoms, temperature check and travel health promotion measures, as well as procedures for referral of suspect cases. The International Health Regulations Emergency Committee, was convened by the WHO Director-General on 18 May 2018, and advised against the application of any travel or trade restrictions to the Democratic Republic of the Congo in relation to the current Ebola outbreak, as flight cancellations and other travel restrictions may hinder the international public health response and may cause significant economic damage to the affected country (see link below). The Emergency Committee also advised that exit screening, including at airports and ports on the Congo river, is considered to be of great importance; however entry screening, particularly in distant airports, is not considered to be of any public health or cost-benefit value. WHO is monitoring travel and trade measures in relation to the current outbreak. As of 28 May, 23 countries have implemented entry screening for international travellers coming from the Democratic Republic of the Congo, but there are currently no restrictions of international traffic in place. The Emergency Committee convened by the Director-General on 18 May 2018 noted that the Ebola outbreak does not currently meet the conditions for a Public Health Emergency of International Concern (PHEIC). The Committee issued comprehensive Public Health Advice , in particular with regards to the fact that there should be no international travel or trade restrictions, that neighbouring countries should strengthen preparedness and surveillance, and that during the response, safety and security of staff should be ensured, and protection of responders of national and international staff should prioritised. WHO has also issued travel advice for international travellers in relation to the current Ebola outbreak in the Democratic Republic of the Congo (see link below). Effective exit screening helps prevent the exportation and spread of disease to other areas. During exit screening at international airports and points of entry, travellers will be assessed for signs and symptoms of an illness consistent with Ebola virus disease, or identified as contacts potentially exposed to Ebola virus disease. Boarding may be denied based on public health criteria. There is a possibility that a person who has been exposed to Ebola virus and developed symptoms may board a commercial flight or other mode of transport, without informing the transport company of his/her status. Such travellers should seek immediate medical attention upon arrival, mention their recent travel history, and then be isolated to prevent further transmission. Information of close contacts of this person on board the aircraft (e.g. passengers one seat away from the ill traveller on the same flight, including across an aisle, and crew who report direct body contact with the ill traveller) should be obtained through collaboration with various stakeholders at points of entry (e.g. airline reservation system) in order to undergo contact tracing. The risk of a traveller becoming infected with Ebola virus during a visit to the affected areas and developing disease after returning is extremely low, even if the visit included travel to areas where primary cases have been reported. Transmission requires direct contact with blood or fluids of infected persons or animals (alive or dead), all unlikely exposures for the average traveller (see link below). There is, however, a risk for health care workers and volunteers, especially if involved in caring for Ebola virus disease patients. The risk can be considered low, unless adequate infection prevention and control measures (such as use of clean water and soap or alcohol-based hand rubs, personal protective equipment, safe injection practices and proper waste management) are not followed, including at points of medical care at ports, airports and ground crossings. Seek immediate medical attention (e.g. through hotline telephone numbers) and mention their recent travel history if they develop Ebola virus disease like symptoms. MSF said in a statement that 25 people had died since the outbreak was declared on 8 May, with 35 confirmed cases of Ebola recorded so far. MSF said it would use funds collected towards care for diagnosed patients and isolation, outreach activities, follow-up with patients, activities to inform people about the risks of Ebola and safe burials. Most of the Ebola cases are in the country's remote Bikoro health zone, which lacks the healthcare infrastructure to tackle the spread of Ebola. The WHO last month reported one confirmed case of Ebola in Mbandaka, a city of 1.2mn. This is a cause for worry because Mbandaka, which is close to the Congo River, which sees significant regional traffic. The Ebola virus, which has caused several thousand deaths, is a communicable viral disease which causes severe bleeding, organ failure and could lead to death. The first outbreak of the disease was recorded in Guinea in 2013 and later spread to Guinea, Liberia, and Sierra Leone, with minor outbreaks in other regions. The International Federation of Red Cross and Red Crescent Societies (IFRC), last month, called for aid to the tune of about US$15.1mn to support its operations in tackling the Ebola outbreak in the DRC. The outbreak of Ebola virus disease (EVD) in the Democratic Republic of the Congo remains active. On 3 June 2018, six new suspected EVD cases have been reported in Bikoro (5) and Wangata (1) Health Zones. Three laboratory specimens (from suspected cases reported on 2 June 2018) tested negative. No new confirmed EVD cases and no new deaths have been reported since our last situation update on 1 June 2018. Since the beginning of the outbreak (on 4 April 2018), a total of 56 EVD cases and 25 deaths (case fatality rate 44.6%) have been reported, as of 3 June 2018. Of the 56 cases, 37 have been laboratory confirmed, 13 are probable (deaths for which it was not possible to collect laboratory specimens for testing) and six are suspected. Of the confirmed and probable cases, 25 (50%) are from Iboko, followed by 21 (42%) from Bikoro and four (8%) from Wangata health zones. A total of five healthcare workers have been affected, with four confirmed cases and two deaths. On 8 May 2018, the Ministry of Health of the Democratic Republic of the Congo notified WHO of an EVD outbreak in Bikoro Health Zone, Equateur Province. The event was initially reported on 3 May 2018 by the Provincial Health Division of Equateur when a cluster of 21 cases of an undiagnosed illness, involving 17 community deaths, occurred in Ikoko-Impenge health area. A team from the Ministry of Health, supported by WHO and Médecins Sans Frontières (MSF), visited Ikoko-Impenge health area on 5 May 2018 and found five case-patients, two of whom were admitted in Bikoro General Hospital and three were in the health centre in Ikoko-Impenge. Samples were taken from each of the five cases and sent for analysis at the Institute National de Recherche Biomédicale (INRB), Kinshasa on 6 May 2018. Of these, two tested positive for Ebola virus, Zaire ebolavirus species, by reverse transcription polymerase chain reaction (RT-PCR) on 7 May 2018, and the outbreak was officially declared on 8 May 2018. The index case in this outbreak has not yet been identified and epidemiologic investigations are ongoing, including laboratory testing. This is the ninth EVD outbreak in the Democratic Republic of the Congo over the last four decades, with the most recent one occurring in May 2017. The outbreak has remained localised to the three health zones initially affected: Iboko (23 confirmed cases, 2 probable, 5 deaths), Bikoro (10 confirmed cases, 11 probable, 5 suspected, 17 deaths) and Wangata (4 confirmed cases, 1 suspected, 3 deaths). As of 31 May 2018, a total of 880 contacts remain under active follow-up.